What? 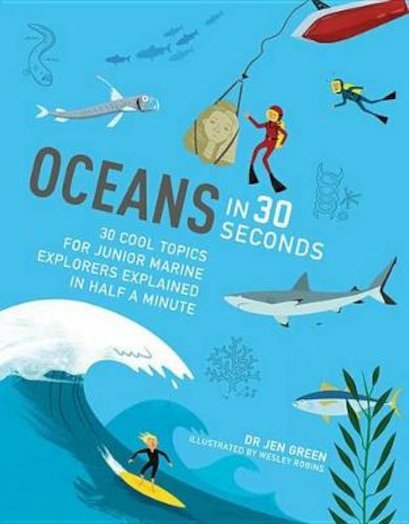 All the world’s oceans in 30 seconds? That’s hardly enough time for a paddle. But you’ll do more than paddle. You’ll explore the planet’s most beautiful beaches, prettiest coral reefs and darkest sea trenches. You’ll see how tsunamis start, marvel at freaky deep-sea fish and even visit an oil rig. How is all that possible? Here’s how. Each double-page spread covers a cool topic in a short 30-second soundbite and three-second flash summary. Plus, there are fun activity missions such as building tectonic plates. It’s a gorgeous book to look at, with stunningly beautiful colour artwork. What are you waiting for? Dive in!